South Okanagan Immigrant & Community Services is working in Penticton, Summerland, Okanagan Falls, Oliver, Osoyoos, Keremeos and Princeton to make our communities more open and welcoming to immigrants. We want a welcoming community where immigrants feel safe and can participate in all aspects of community life. The Welcoming Communities Project’s goal is to get the city, employers, and community partners to work together to build a more inclusive environment where newcomers feel accepted and can be successful in the workplace. Welcoming Communities is an initiative to develop our area as an inclusive community that welcomes and sustains new immigrants. The South Okanagan has an active art community and we recognized this as an opportunity for our Welcoming Communities program. In partnership with the Penticton Art Gallery we put a call out to artists living in the South Okanagan, inviting them to meet with a recent immigrant to our community with the goal of creating a work of art in partnership with, or individually, that would document or express the immigrant experience. The title “Welcome / Home” reflects the complicated relationship immigrants have between the place they have left behind and the community in which they are working to settle into and make their new home. The objective of the exercise was two fold: first to provide insight into the world each immigrant left behind and the world they are trying to embrace and second, to connect these immigrants with individuals in the community outside of their current circle of contact. Foreign-born residents tally for almost 20% of the national population. Immigrants will account for 80% of B.C.’s population growth through 2036 (BC Statistics, 2011a) and already represent net growth in our labour market. Although the majority of immigration is to Canada’s larger cities, smaller centres are recognizing the positive impact, both from a social and economic perspective, that newcomer Canadians bring to an area. Newcomer Canadians were matched with local artists. Through their encounter and interview, the artists created a rendering. The program was extremely successful with twenty-four art pieces on display at the Penticton Art Gallery from January 24th through March 16th 2014. Over 1000 guests visited the exhibit during the six weeks. We launched the display with a World Beats dance celebration with over 500 in attendance and over a thousand more visited the exhibit. There were also a number of non-measurable results of community awareness and within the new relationships that had been built. Through the Penticton Chamber of Commerce, we proudly present this award to a business who practices and promotes a workplace culture which creates an inclusive and welcoming environment that successfully reduces barriers for all. These practises foster a culture and commitment to employee development that reflects diversity of community and values cultural differences. The Business Excellence Awards have been recognizing Penticton businesses whose business achievements or community involvement have made significant contributions to the economic and social well-being of the City. The way we do business in the South Okanagan is changing as our population is becoming more diversified. In 2006 16.6% of the Okanagan-Similkameen regional district were immigrants. It is estimated that this number will increase with the 2010 census but will it increase enough to keep up with the demand for skilled workers? With the aging labour force, finding skilled workers is becoming more difficult, and more employers are looking to immigrants as the solution to their labour needs. There are many highly-skilled immigrants living in our region that are looking for the opportunity to put their education and experience to use. As a result of research SOICS conducted in 2010, it was discovered that employers felt they lacked the resources and support needed to fully access and utilize immigrant workers. In response, SOICS, through funding from the Government of Canada and the Province of British Columbia, has built a toolkit specifically for the needs of South Okanagan-Similkameen employers. Have only Canadian experience, only foreign work experience, or a bit of both. The South Okanagan currently has a pool of highly skilled immigrants living here who are seriously underemployed or looking for work opportunities. They are just waiting for an opportunity to apply their skills and experience to your business. This toolkit will provide you with the knowledge and resources you need in order to find, hire, and retain these skilled workers. Under the Welcoming Communities, SOICS launched a unique program that encourages local residents to help create a Canadian Experience for Newcomers. 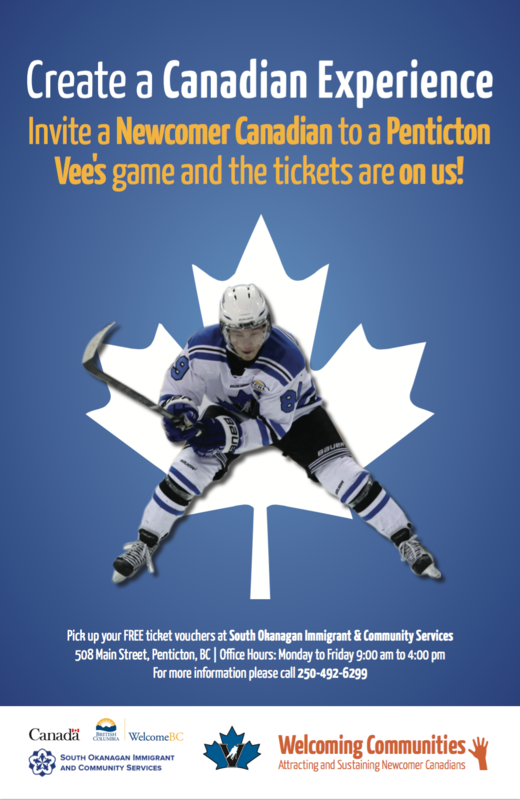 Residents were asked to invite a Newcomer Canadian to a Penticton’s Vee’s Hockey Game and their tickets are FREE (2014 playing season). Many of our clients, and even some of our staff had never been to a hockey game. Without someone to explain all the sights and sounds, our national pastime in a big arena could be intimidating. Our goal was to assist integration for new immigrants. They often tell us that they just want to meet new people and have a Canadian experience. What better than a hockey game? The promotion began with the January game and will run through the remainder of the regular season, with the last home game scheduled for March. Participants were asked to drop by the SOICS office in Penticton to pick up their free ticket game vouchers for themselves and their newcomer immigrant guest. Recognizing the increasing diversity in the South Okanagan Similkameen, SOICS initiated a two-part project funded provincially by the Welcoming & Inclusive Communities & Workplaces Program in 2009-2010. The first step was to promote Knowledge Development through an extensive study of current services and successful practices to encourage Welcoming and Inclusive Communities and Workplaces. The project identified gaps in services for newcomers to promote their full inclusion and participation in the communities of the South Okanagan Similkameen. It went on to successfully identify successful programs/initiatives on the topics of cultural diversity/multiculturalism and workplace diversity/cultural competence forming a model for future initiatives. Equipped with these research findings, SOICS commenced part two of the project involving Public Education. Acknowledging gaps, SOICS identified best practices and successful programming to support newcomers in the region. This information was disseminated through the publishing of its Welcoming & Inclusive Communities Employer Toolkit and a series of diversity training sessions to local organizations and community stakeholders. The evolving diversity of Canada has significant implications and provides important opportunities for the voluntary sector. Organizations should ensure their volunteer pool is reflective of the diversity of their communities. This reflection will provide great advantage in maximizing their appeal and effectiveness within their communities. Prioritizing efforts to attract candidates from a diversity of communities will deepen organizational knowledge and skills for outreach, policy and program development. Volunteering is seen as an important opportunity to particularly assist newcomers from around the world in developing and enhancing their cultural and professional integration into Canadian society and workplace. This is an opportunity for the voluntary sector to benefit from the usually strong professional and technical skills that New Canadian volunteers bring to organizations. It is important that the Sector ensures opportunities for volunteer involvement are accessible and barrier free. On top of learning all the cultural nuances and mastering a new language, the development of social networks is important to successful settlement of new Canadians. New comers need and want to develop professional relationships in order to feel that they belong in the community and in their new country. A meaningful volunteer position can go a long way in providing these networks. Penticton City Hall renovations were scheduled to begin in 2014, which included updating all of their service signage. SOICS approached the City about the possibility of making Penticton’s key civic building more welcoming to new Canadians and individuals who have English as a second language. The concept of having a feature wall in the front lobby of City Hall highlighting the word “welcome” in multiple languages began taking shape. The renovation project was completed in 2015. In partnership with SOICS, the City of Penticton unveiled a diverse collection of “welcomes” on March 30, 2015 at City Hall. Prominently displayed inside the building’s entrance, guests are now greeted in Chinese, Dutch, French, German, Greek, Punjabi, Italian, Japanese, Korean, Portuguese, Russian, Spanish, Tagalog, Thai, Vietnamese and English. The renovations also included international symbols to help customers identify which service they need and recognize what counter provides that service. New Canadians and immigrants are a key element to resident growth in the South Okanagan, and nurturing their experience in the community is a key economic development strategy for the City of Penticton. The new signage also advances the mandate of SOICS, which helps immigrants with settling in the area. Recent statistics show that between 2001 and 2006, the South Okanagan Similkameen had approximately 460 new immigrants, representing 26 per cent of the net growth of the region. The area currently receives approximately 100 immigrants per year and, based on general population growth projections, this number is anticipated to double.